I too grew up in your neck of the woods (Civic Park) and ran those neighborhoods, mostly in the 50's and 60's. I have been thinking lately about my Jr. High teachers and what an impact a couple of them had on me. Without a doubt, the teacher who gave me the most was Mr. Whitman in 8th grade English. He had us write a pretty complete book of English word and phrase usage that I still have today. He taught me how to speak & write with reasonable clarity. I hated it at the time, but have been grateful to him for most of my adult life. Thankyou Mr. Whitman. Were Mr. & Mrs Whitman still teaching English at Longfellow when you were there? Flint may be just an old factory town, but I was exposed to a first rate educational system. I'm afraid I don't know the answer, GH. For some of my middle school life, we lived out of the country (my Mom's home, the UK), and then once the Academy opened I left Longfellow. I was there for 7th grade and a little piece of 8th. I only remember Mr. Wiltse (social studies), who married the art teacher... and that I was very unhappy there -- at Summerfield, next door, you prepped in fear for Longfellow. My mother grew up in the Civic Park area and she has so many wonderful memories of her childhood. Her home is now boarded up as well. Many houses are boarded on her old street. (Mt. Elliott)I have many wonderful memories of thios area as well because I visited my grandmother and uncle many times.Your journey mirrors mine sarah. 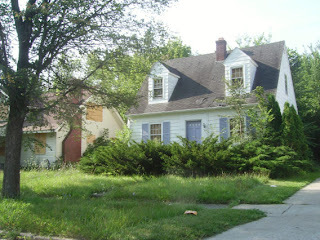 The first time I saw my grandma's house all bedraggled and run down and smashed up...I cried for hours. There is a for sale on it now. i had a dream that I came back adn fixed it up...Ahhh..my youth is slipping away. I lived in the neighborhood, too, in the 60s--on Mallery, just north of Ballenger. That was a good place to grow up--in the day. Alas, too many "bars" there now. Am I hallucinating, or did Mr. Whiteman have curly silver/black hair? I remember Mr. Clevenger--he threw scissors at one of the kids one day. I guess he'd reached his boiling point. Then there was the teacher that had the "white stuff" in the corners of his mouth--what was his name? Come to think of it, that may have been Mr. Clevenger. Mr. Clevenger - I loved him in the sixth grade, he was so much fun... and then a black friend shared, years later, that he was the most racist teacher - actually physically confrontational - that she had encountered in the Flint schools. I was stunned. The guy with the white flecks on his mouth, was that (dare I print this name) Mr. Willie?? The math teacher? Thanks for your kind perspective on the house, ChurchGuy. I'll be sure to share it with my Mom, who still misses that house. I was probably classmates with Church Guy and Anonymous--I certainly remember Mr. Whiteman and his pronoun song. 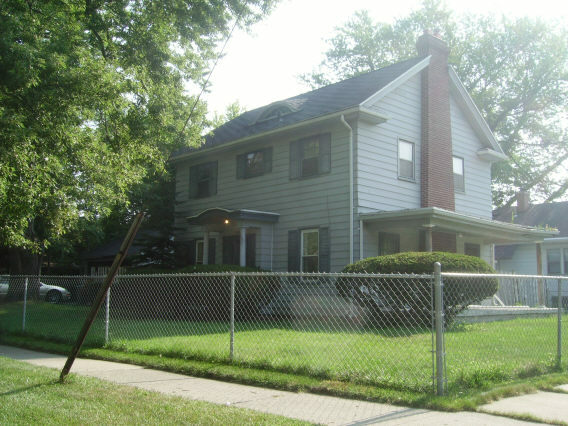 Since you are talking about my old neighborhood, I thought I would post a picture of my house on Prospect St., which is for sale, if anyone wants a bargain at $16,ooo. I lived at 2710 Prospect. 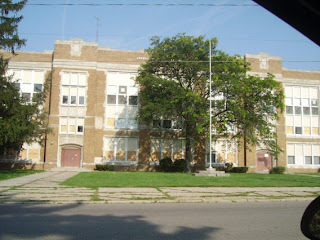 Attended Longfellow, then last from our neighborhood to go to Flint Central. Mr. Willie(sp)? Could have been--might have been. I'd forgotten all about Mr. Willie. If any of you were present for the serial showings of "The Creature From the Black Lagoon," during lunch hour, I was the guy upstairs running the projector, splicing the film, and changing the reels. I also was the guy who put up the red and blue floodlights in the gym for the dances (remember those), and I used to work after school making coffee and opening up rooms for the adult education night classes. I'm sitting here wondering how I got that job. You guys are really maxxing out my memory chips! Sarah Did your Mom belong to the Trans-Atlantic-British Club? It was quite large back in the 60's and 70's. My mom was a transplant to Flint. Paddy McGees on St Pats day I was always there. There was good time growing up on the west side. At the time you was at B. Dalton I had my first job at Sears. Easy days back then. I was right in there with my pal the Church Guy. How about Mrs Stanton the music teacher who had us copy endless pages of outlines on the classic composers that she would have on the blackboard. Then there was long and tall and ooooold Mrs Walters, the art teacher. Don't even get caught wasting paper. My favorite was Mrs Bloomenthall (sp), the beatnik teacher. She had those way-out triangle shapped glasses, beret, big sweaters, the whole bit. She would haul this huge bag over her shoulder onto her back. I swear it would'a strained a sherpa. She called us "people". She'd say "that will be quite enough people". Alright, that's quite enough. And I spent many meals at Ruggero's while I was growing up. I loved going there. These ranked as old Flint's best! Pizza from either of these places was a special treat the Gearhart house. I did like that out-of-tune piano playing dixieland at Shakey's Pizza Parlor out there on Clio Road. Okay, that's it, I'm gettin' me something to eat and pack for my trip to Michigan tomorrow. Y'all have a great week. I'll tell Flint you said "Hi!" What I remember on Clio Rd (besides the Golden Point & McDonalds) was Farrells.... my Mom was always horrified by that huge order that they challenged you to eat. And at Summerfield, Mrs. Mrozik was the music teacher. Weirdly, she taught us all the armed forces songs. She looked like a collection of melons. My best friend's dad had an affair with her, and that truly messed up the casting for the school play (my best friend got, then mysteriously lost, the lead). I had to email my mother about the Trans-Atlantic Society, I'll let you know if I get a response. I went to Summerfield & I remember Mrs. Mrozik was married 3 times while I was there, when divorce was a little less common. I graduated in 1989 & grew up on Golfside by Mott Park. Ferrells, Oh yeah! I think they had a player piano. I do remember waiters in old-timey costumes (red suspenders/stripes/straw hats?) and how they would bring out "the Pig's trough" or the "Pikes Peak" out on a stretcher-like rig which took two waiters to hold up as a siren sounded. They would sort-of gallop around to show it off en route to your table. Inventive but a bit bizaree now that I think about it. Such character! "A collection of melons"? I love that...although I'm not absolutely sure I know what you mean. And, yeah, thanks, Sarah, for fanning these memory flames. You'll be happy to know that my one and only wife of 36+ years graduated from Ainsworth, too! Oh, and does anybody remember Mr. Majeski from Longfellow? I'm thinking he was the instrumental music teacher. And, somebody, please help me remember the name of the speech teacher in the mid-60s. Please! Mr. ______________. Do you remember Mr. Kuhn? He was also, a music teacher..He was the nicest teacher. I though, he so good-looking..I had the most memorable moments at Longfellow..What a great time in my life..
Was it Mr. Hill? I do believe it was. Randy, let it go...at least for tonight. You've got a big trip ahead of you tomorrow. lol. Just one more thing.... When the Westside market on the corner of Ballenger and Flushing burned, we stood at the windows in Mr. Willy's room and watched the black smoke billowing up. This must have been around 1961 because that would have been 6th grade. I'm trying to remember the stores on that block. There was Westside Mkt on the corner, Ben Franklins with the hardware store attached, Underhill Drug store, Economy Floors and some doctors office.Was there something between the Westside Mkt. and B.F.? Gaines Jewelers. Later, there was a video store on the corner, a seedy video arcade, an ice cream shop... a Pumpernickels across the street? That was/is one heckuva stretch o' Flintness. 777 Party Store (grab me a fifth of Wolfschmidt Vodka), Supreme Doughnuts, Golden Gate Coney Island, Barber College, Chambers, Diplomat Pharmacy, Beaver's Market/Salvation Army, Lafferty's/Point After/Bikini Bar/Neighbor's Pub, Paddy McGee's, Sorrentos (yuck), that nasty restaurant across the street from Sorrentos (Was it called Pella's? ), Burger Chef/Captain Cody's, King Arthur's, King's Armor, C-C-C-Coney Conexion, Hamady ($1.09 40s of Black Label), the combo collision shop/pet store on Flushing and Sutton, Michigan Video, Jumbo Video, Troy Cleaners (c'mon, how could one not appreciate the majesty of ever lovin' Troy Cleaners?) and of course the short-lived and much-maligned Murph's Cafe. One could go on and on. In fact I just did. Can any other commercial district in Fli... nay, the WORLD compare with such a stunning array of commerce? With all of that action why'd you want to go anywhere else? Richfield and Center? HA. Fenton and Atherton? Puhleeze. The Magnificent Mile? Gimme a break. The Istanbul Bazaar? Maybe you like paying premium prices for your Hot Pockets and King Cobra. Smart shoppers know that hustle, bustle, and true value reside on the border of Flint town and township. Book a room for your retirement at Kith Haven NOW. Gee Wally, that Ballenger and Flushing Wurstside talks about don't sound nuttin like the one I remember. Aw cut it out Beaver, you know nothing stays the same. All those places you liked are long gone now. Besides, if Dad caught you messin around down there he'd murder ya. Now go to sleep before I come over there and clobber ya myself. I think i'd kinda sorta'd like to remember it like it was anyhow. You know, cause I don't live there anymore. I had forgotten all about Farrells - what memories! The best was when they began to blow all the whistles and blink all of the lights, although I can't remember WHY they did that. It may have been for birthdays, but it may have had something to do with that massive bowl that Sarah was refering to. I wonder if Mr. Tucker still has Paddy McGee's - I heard that he bought it when he retired from Powers. Hey jbing, the more things change the more they stay the same. Most o' the places I mentioned are long gone too. Lets grab a few pints of Relsky at Happy Boy, head on over to Eldorado Vista Park, hash out our differences, and then have our casts set by the old bone doctor dude on Flushing Rd. Dunno his name, but he's been there for decades- probably since you were around. As far as remembering the way it used to be... yea, I feel ya... but c'mon, take a look around Triple 7. Whatta selection!!! Ye goode olde days yielded a 6 pack o' Drewerys and a half pint of Popov at best. The plethora of intoxicants to be found nowadays can't be beat... drink up, bub cuz drinking to forget is better than forgetting to drink. YOWZA. CONFIDENTIAL to Banzai Bozo: Big Bear, Coqui 900, Yuengling you name it... its on me. First, my Mom responded and said YES, she belonged to some-or-other British group that included many (other) teachers (Mom was also a teacher). But she doesn't remember a single name, not even the name of the group. Soo.... maybe? And as far as the plethora of businesses at Paddy McGees' corner (tho' I loved the list), I think that all I saw there on this trip was a cleared lot. Wurstside, It would be an honor to slam some Ukrainian swill with such a stalwart Flintite as yourself. However for the lasy 35 years I've lived near the shores of Lake Superior and trips to the old stompin grounds are few and far between. Do yourself a favor and try a tour of the brew pubs of Gods Country. You'll find em in Paradise, Grand Marais, Marquette, Ishpeming and Houghton to name a few. By the way, what's Eldorado Vista? Does that relate to the Eldorado Drive between Mackin and Flushing Rd.? Eldorado Vista was the first housing subdivision built on Eldorado drive. It went up in 1962 or 63. Before the evil contractors came with their bulldozers, it was massive rolling fields reachable from Sutton, Berkley, Raskob, etc. It was full of Pheasant nests, feral cats, homeless dogs, wild strawberries, and hhundreds of Monarch Butterflies. It was as close a Flint cty kid could come to living with nature and not leaving home. I happily spent my early teens in summertime there from 1960 to 62 until the area was destroyed by so-called "progress" with Eldeorado Vista. The last thing in my opinion the area needed at that time was oversized homes dwarfing the rest of the small houses. They were all owned by the 1960's version of today's yuppies. I wonder if they are foreclosed and abandoned like the nearby neighborhoods. Anyone remember the Dr.'s office there on Chevrolet, just north of Welsh? Dr. Lirones? He passed away just recently, and had a very distinguished War record-numerous citations and medals, a true Hero. He was our family physician for years, and attended Comm. Presbyterian Church w/my family. Sarah- That is neat that your Mom belonged to the club. The only names I know is Carol and Vera and I think they passed. There was so many of them in the group in Flint they could charter a plane and fly to England. Went back to England on and off many of times because of that club. Great speaking to you and looking forward to more blogs. I knew Dr. Lirones. I didn't know of his war record however. Was it WWII or Korea? I know who you are. I spent many a sunny afternoons in that pool. Please contact Gordie for my email. I want to catch up on you and your family. Where is Amy? We'll have to catch up. Amy was a Flint Expatriate for a while living in London and then in Florida for several years. Now she's back in the Flint area (Davison). I gave Gordie my email to pass along to you. This makes me want to cry. I lived at Norbert and Marquette and walked to Summerfield as a second grader (and was in the school choir with Mrs Mrozik). Imagine doing that now! My grandparents lived in that beautiful red brick house on the corner of Milbourne and Sloan. It has a full apartment upstairs that my great-grandparents used to live in. I just found out that it's for sale for $30,000. $30,000! WTF! And Longfellow's boarded up? I guess it's true-You can't go home again. I grew up on Berkley St. and had both Wightmans, and Clevenger. It was said that Mrs. M Wightman was fluent in seven languages, read read about 11,000 words a minute, five newspapers a day, 26 magazines a week (so don't try to plagerize! ), and had a photographic memory. She told my class she hadn't missed a day of school in 25 years, and that she had no time for colds. For their entire marriage, she and Mr. Wightman dined out. Mr. Clevenger said one day that he was going to BREAK ALL THE RULES AND SHOW US HOW TO DIAGRAM SENTENCES. Everyone loved it. Imagine trying to get away with that today! It was said that Mrs. M Wightman was fluent in seven languages, read read about 11,000 words a minute, five newspapers a day, 26 magazines a week, and had a photographic memory (so don't try to plagiarize!). She told the class she hadn't missed a day of school in 25 years, and that because she had no time for colds, didn't get any. For their entire marriage, she and Mr. Wightman dined out. and wave it about, or the rest will be wanting one, too." I had Mr. Willey for Fifth Grade Math. He was a great teacher, and inspired me to take Math well into my college years. Also the third grade teacher, Mrs. Bea Marshall, was great at teaching Math. The Fourth Grade Math Teacher was HORRIBLE though. Can't remember her name. She gave timed multiplication table tests. She would keep moving the goal by starting the stopwatch EARLY. I could HEAR it ticking on the other side of the room. I called her on it and she became very belligerent. I almost always got As in Math from very early on. I got a B in Math that year. I didn't get another semester B in Math until I took Differential Equations in Graduate School. Remember the shopping center, I think it was just north of Mackin Rd. on Chevrolet Ave., where the original Ruggero's Pizzeria, McKay's Market, and Ryckman's Drug Store were? Remember that huge smokestack on the power building at Longfellow? Seems like they shortened it and then took it down completely. I started school right after Sputnik was sent up, and one would never have known the level of decline that would occur after that. I remember that they had accelerated high school courses for a while, but political correctness forced their sublimation to certain class sections. Now most schools call them AP. Valedictorians and Salutatorians and Homecoming Queens and Courts were also discontinued, though you still had a good idea who would have been selected. I was told that there were student council conversations about these things where they voted on unpublished lists, but it was not a subject for official school comment. Clyde Burtrum Furs still has spots on Detroit Radio and TV, one of the few remaining spots sung by Larry Santos. Whoops, that's actually Dittrich Furs, though the music would work well for Clyde Burtrum also. I grew up on Raskob by Chevrolet and attended Summerfield and Longfellow, the area has made a huge change and it is unforunate for many they will never experience a childhood growing up in such a nice area. The area was great with its parks and shaded streets, all the familys that lived there and still recall the days. I recently ran into Rita Short my 3rd & 4th grade teacher at a doctors appointment, and she new by face, how amazing is that. Does anyone remember who taught biology in the late 1960s? "Milbourne Memories" I just read this comment series from the 08 post. I have to say that it is the consummate collection of any neighborhood post on this blog. I had relatives in that neck of the woods and spent a lot of time traipsing from Ballenger Park to Civic Park, Iroquois Park, and Chevrolet Ave to Flushing Rd. I remember some of the names of folks that were mentioned during that era and the tranquility of that beautiful collection of neighborhoods that comprised that section of Flint. I swam at Haskell, played pick-up football games on Comm.Pres's nice lawn and picknicked at Forrest Park when the zoo was still there. Played basketball at Longfellow when McKinley JH was their opponent. Knew a couple of the teachers on the staff there.Shortly before Dr. Frank Manley put together the best community school system in the United States. A show place middle school concept that had interns coming in from Canada, Europe, and Australia to study it's structure and after school adult and student enrichment programs with the help $$$ of the Mott Foundation. Pat Barley and the thirteen original Community Directors were in place when I returned from the service. What a collection of quality and effective individuals they were. Anyway, I got a lot of good visual memories from reading you guys' remarks. Thanks. I was at Longfellow from 1954-1957. I had Mrs. Wightman for three years of Latin (took 4th year at Central) and Mr. Wightman was my homeroom teacher, in addition to 8th grade English teacher. In addition to what has previously been said about him, I remember each year on the last day of school he would sing "Danny Boy" and to this day whenever I hear it, I think of him. Hilda Turbush was our math teacher ... Ryckman's Drug Store was across the street from Civic Park school. We used to have chocolate soda's and cherry phosphates sitting on those red bar stools and waiting for prescriptions to be filled. Gary Ryckman was a classmate of mine. We lived on Landon in the first house off Dayton and then moved around the corner on Brownell and lived in the two story brown house across from the woods. They still had four years of Latin in the 1950s? I think that must have changed soon after. I think there were only two years after that. Mrs. Helene Foster taught Latin at Southwestern for second year Latin, and Mr. Dale Kildee taught Latin at Central. I don't know if Northern and Northwestern had Latin or not. Southwestern was the highest scoring school for a few years on the National Latin Exam, administered by Dr. Worlsey. I grew up on Milbourne between Hamilton and Dayton. Went to Civic Park, Longfellow and then Southwestern. 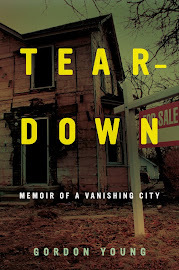 If you remember the area, you should read Teardown by Gordon Young. He has a chapter specifically covering Milbourne between Hamilton and Dayton as the only viable block in the greater area. Does anyone know where Helene (Burns) Foster is now? Is she still alive? I called Mr. Grindstaff (Civic Park) a few years ago and thanked him for his influence on me. He was 90 years old and still coherent. He remembered me. I was stunned. Lynn, who taught Latin at Central when you were there? Does anyone else know how long Henrietta Lewis taught there? I seem to remember that she taught up to the time Dale Kildee taught there. Does anyone else have stories regarding Henrietta Lewis and Dale Kildee teaching Latin there? I grew up on the corner of Thomas and Norbert, a couple of blocks from Mott Park and went to Longfellow K-9 (Summerfield was built after I was out of elementary school. I remember the Whitemans tho steered clear of their classes. Didn't the Cates (husband and wife, Ralph and Helen) also teach at Longfellow? They were good friends of my parents and lived just a couple of houses away on Thomas. I had the misfortune of having Miss Harwood for both 3rd and 4th grade, such a sour woman! My mother told me later that she wasn't really fit to be a teacher becasue she didn't really like kids. Regarding Mrs. Stanton, I have a vivid memory of passing her in the hall during class change the afternoon of November 22, 1963. Another teacher was talking to her and a look of absolute terror came over her face. I remember how odd it seemed at the time but a few minutes later I knew why. We were in Mr Willy's math class when the principal came over the PA to tell us. I remember I had never seen so many adults cry or be traumatized. It all seemed unreal to me as JFK was just somebody on TV and people on TV died all the time. Mrs. Wightman was one of those teachers who truly cared about her students, as did her husband, Paul. WE were their children. They expected a lot from us, but we learned because they believed so fully in us. Mr. Willey crooned Moon River like no other. Mr. Clevenger, Mrs. Lambertson - such incredible teachers. Another generation - Mr. (Rick) Vosburg - is still as cool as he was back then - only with much less hair ;-) Yes, my old, beautiful house was boarded up the last time I was there. It was such a safe, incredibly wonderful place to grow up. I grew up on Prospect Street, two blocks east of Ballenger Highway. Did you know the Kingsburys ? They lived on the corner of Ballenger and Stevenson. The Hogans lived around there, too. Mr. Hogan owned Longfellow Barber Shop on Chevrolet at Mackin. I was back in town in '03 and the barber shop had moved to Corunna and Dye and was run by his son. I knew Dr Kingsbury. He and his family lived on the Corner of Fremont St. and I think it was Bagley St. He was our family Doc for many years. I left Longfellow in 7th grade and went to St John Vianney 8th-12th. My Sister was in the last graduating class there before Powers opened. Last night, I dreamed vividly that Mrs. Stanton had come back to lecture at Longfellow, after an absence of nearly 50 years. She seemed to be a caricature of herself, notwithstanding the fact that she would now be well over 100 years old if alive. I managed to be in my seat five minutes before the bell rang, sparing me a visit to Dr. Mobley’s office, only to discover I’d forgotten my lined, bound notebook. Fortunately there was a handout to write on. Any Freudian analysts out there? This definitely demands interpretation by an expert. I forgot to mention that Mrs. Stanton didn't look anywhere near as tall as I remembered. Further research reveals that Mrs. Stanton resided on Ida Avenue, also just a couple of blocks from The Hammerberg Road. Her husband's investment office was on Court St., across from Mobley Park, named for Mayor Mobley, Longellow Principal Dr. Mobley's father. How's that for connecting the dots? Dr. Jack Mobley was the Longfellow Principal's full name. Charles Mobley was the Flint Mayor's full name. Why do I refer to "The" Hammerberg Road? I have been watching syndicated "Hogan's Heroes"reruns on MeTV M-F at 10:00 PM. It cracks me up when they talk about "The Hammelburg Road" which connects Stalag 13 to nearby Hammelburg, Germany in the series. Hammelburg was definitely a long day trip to Paris, where they famously travelled in the series. You can learn a lot about Geography from the series if you look it up. It's more fun than "Where In The World Is Carmen Sandiego". I remember the Sav Mor store on Flushing Road. They played an FM radio through the PA System in the store. It was the first time I ever heard an FM station besides the WFBE programs we heard over the PA System at Longfellow. It was about 1963 or 1964, and they had WXYZ-FM on in the store, which became WRIF in 1971. Mrs. Stanton was our homeroom teacher from 4th thru 6th grade, that was the way it worked back then. On the last day of school in our 6th grade, she stood up and told us that this was her last year as a teacher, she was retiring, and we were the cause, as we were the worst class she had ever taught. We were jerks, no doubt, but I always thought this was a little over-the-top. Wow. I think I was in Mrs. Stanton's Homeroom. I remember getting yelled at for singing too loud once, but that couldn't have been it. Glad I left Longfellow after the 5th Grade! Couldn't have been me. Does anyone here remember a student named Jeff Krakauer at Longfellow, Southwestern, or Central back in the late 1950s or early 1960s? All this news is coming out about Jon Krakauer, who wrote the book that the movie "Everest" is based on, and somewhere, Jeff Krakauer came to mind. I graduated from Northern High School in 1968. I remember a guy named Jeff Krakauer who was a year ahead of me. I didn't know him, but I knew of him. He might have been two years ahead of me at Northern. I was in Mrs. Stanton's Homeroom. One day, I was working on Homework. I broke my pencil and quietly let out an expletive. Christine Handell heard me and threatened to tell Mrs. Stanton. It was the last week of school, but it was a fearful one. I don't think Chris ratted me out. I'm glad I lived and went to school in Flint when I did. It was a great place then. Later, not so much. Try looking through lists of people you might have gone to school with somewhere else, on Facebook or Classmates type lists. Scary, and I'm not the only one who says this. Does anyone remember (or went to) The Raskob Units? They were a part of Longfellow Elementary in the late 1950's and the early to mid 1960's. They were four one room units. They looked like Double Wide Mobile homes. Three of them were on Raskob Street and the last one was on the side street. 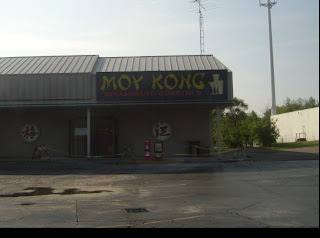 Seems they were torn down because I tried to find them on Google Maps. Anyways they were set up K-3rd grade. Each Unit was a Grade and you moved to the next one after finishing your Grade until you moved to the last one on the side street. Except for whatever reason our class moved from the Kindergarten Unit straight to the 3rd grade one and finished 1st-3rd in that one Unit...I never knew as to why. I can only remember the 3rd Grade Teacher's name. I was in her class (3rd Grade) when she got a phone call. I always will remember that because she received the call about JFK being shot. All the other teachers came over and were crying. Mrs Fishkin simply told us to go home. Even though were were young we understood and we were very sad too. I lived at 2711 Berkley Street. We walked to the Units everyday. We even went home for lunch. Longfellow was still great in the late 60's, but went downhill rapidly after that, as did the neighborhood. My brother is busy snapping pictures of the houses in the immediate neighborhood that are slated for demolition. They seem to be concentrating on that area. If you want to see your old house, you'd better do it soon. I lived at the corner of Milbourne and Welch from 1970-1974 that's when I left Flint.